What was that? Oz never did nothing for the Tin Man? 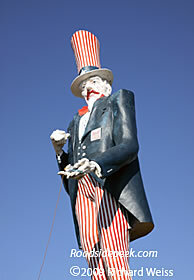 Well, looks like the tin man is relegated to holding up a sign for a heating company called Brennan Heating. So much for Toto. 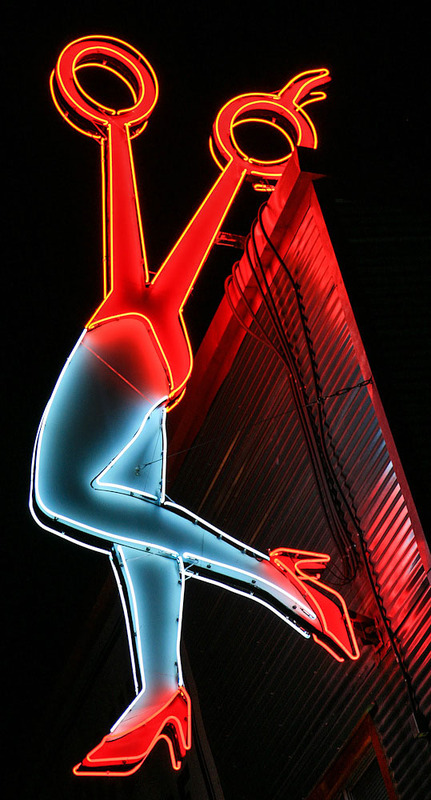 Back in the 70's, this place was a super-club on it's last legs. It then turned into "The Clubhouse" in the 90's when a dog track opened nearby. 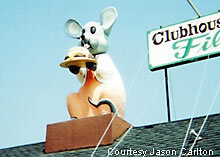 Now defunct, the large mouse still remains perched on the roof. Some people feel that Elvis was larger than life. Well, at least in this example, he truly is. 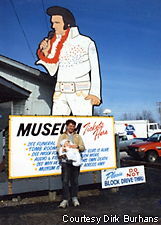 Check out the sign for the Elvis Museum, located in Foristell, MO. Hungry for some good fried chicken? Well, Fast Eddie's is the place, especially if you want to pay a visit to a chicken on a roof. 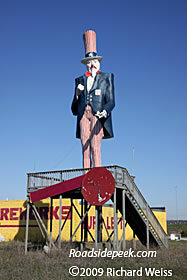 This Alton, IL landmark is not necessarily fowl. 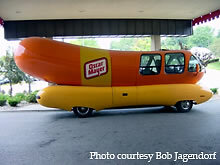 Here's a shot of the Oscar Meyer Wienermobile as it sits outside of a hotel in Kansas City. 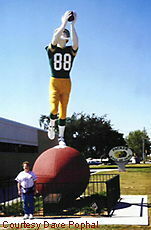 At the Green Bay Packer Hall of Fame in Green Bay, WI is a huge statue of this Packer football player. The Hall of Fame can be found at 855 Lombardi Avenue. Maybe someday, a statue of Brett Favre will be nearby. 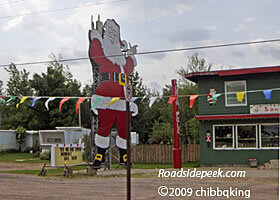 Travelers passing through the Michigan town of Christmas will (appropriately enough) pass by this cheery and rather large Santa Claus character off the road.